Abstract: This study was conducted to evaluate the effects of salt stress and seed priming on germination performance, growth and physiology of five wheat (Triticum aestivum L.) landraces from Jordan namely; Ramtha, Ajloun, Madaba, Tafila and Karak. Results indicated that salinity decreased seed germination, relative water content, membranes stability index, shoot dry weight, leaf chlorophyll content and nitrate reductase activity. These effects were more pronounced in Ramtha, Ajloun and Madaba landraces as compared to Karak and Tafila. Significant increase in the accumulation of proline, total soluble sugars, soluble proteins and H2O2 was also observed in response to salinity, although variations existed among ladraces. Based on tolerance indices collected from parameters tested, the five landraces were clustered in two groups; Tafila and Karak landraces formed the first cluster while the second cluster consisted of Ajloun, Madaba and Ramtha landraces. The landraces of cluster 1 were classified, based on similarity and distance indices, as salt tolerant while those of cluster 2 were considered as salt sensitive Priming seeds with 50mM CaCl2 stimulated salt tolerance in all stressed wheat landraces via improving growth, stabilizing cell membranes, enhancing chlorophyll content, promoting the nitrate reductase activity and ROS scavenging activities in addition to up-regulating the accumulation of proline and soluble sugars. Results suggested that seed priming with CaCl2can be utilized for enhancing the salt tolerance potential of wheat and could contribute to promoting its cultivation in salt affected soils. Tamimi, S. M. (2016). Effect of seed priming on growth and physiological traits of five Jordanian wheat (Triticum aestivum L.) landraces under salt stress. Journal of Bioscience and Agriculture Research, 11(01), 906-922. Tamimi, S. M. “Effect of seed priming on growth and physiological traits of five Jordanian wheat (Triticum aestivum L.) landraces under salt stress”. Journal of Bioscience and Agriculture Research, 11.01(2016), 906-922. Tamimi, S. M. “Effect of seed priming on growth and physiological traits of five Jordanian wheat (Triticum aestivum L.) landraces under salt stress”. Journal of Bioscience and Agriculture Research, 11. no. 01(2016), 906-922. Abstract: In the present investigation, we determined antifungal and antiradical activity of leaf extract of Moringa stenopetala (Baker f.) Cufod (Moringaceae). Extraction was carried out by maceration technique using methanol as solvent. Antifungal efficacy was determined by poisoned food technique against 8 seed borne fungi. Antiradical activity of extract was screened by DPPH and ABTS free radical scavenging assays. The extract was effective in inhibiting the growth of all test fungi and the effect was concentration dependent. Species of Aspergillus were found to be more susceptible to leaf extract. The extract exhibited marked dose dependent scavenging of DPPH and ABTS radicals. Scavenging of ABTS radicals was marked when compared to DPPH radicals. The plant appears to be promising resource of bioactive principles having antifungal and radical scavenging potential. The plant can be used against phytopathogenic fungi and oxidative stress. Kekuda, T. R. P., Raghavendra, H. L., Solomon, T. & Duressa, D. (2016). Antifungal and antiradical potential of Moringa stenopetala (Baker f.) Cufod (Moringaceae). Journal of Bioscience and Agriculture Research, 11(01), 923-929. Kekuda, T. R. P., Raghavendra, H. L., Solomon, T. & Duressa, D. “Antifungal and antiradical potential of Moringa stenopetala (Baker f.) Cufod (Moringaceae)”. Journal of Bioscience and Agriculture Research, 11.01 (2016): 923-929. Kekuda, T. R. P., Raghavendra, H. L., Solomon, T. & Duressa, D. “Antifungal and antiradical potential of Moringa stenopetala (Baker f.) Cufod (Moringaceae)”. Journal of Bioscience and Agriculture Research, 11 no. 01 (2016): 923-929. Authors: Islam, S. A., Miah, M. A. Q., Alam, M. M. & Rasul, M. G.
Abstract: Two trials were conducted to assess the site-suitability and growth performance of ten woody medicinal tree species planted in the year of 2014 and 2015 at two different sites namely Bogachater of Sitakundu upazilla and Bamansunder of Mirershorai upazilla under Chittagong district (eastern coastal belt). Data on survival, height, collar diameter, dbh, stem length and number of branch were recorded from 02 years and 01 year old two trial plantations. In Bogachater site, the result revealed that the highest survival was recorded for Terminalia catappa (89%) followed by Terminalia arjuna (78%), Azadirachta indica (70%), Terminalia belerica (66%) and Anthocephalus chinensis (64%). The highest height was recorded for Acacia catechu (3.06m) followed by A. chinensis (2.63m), Bombax ceiba (1.93m), T. arjuna (1.89 m) and T. catappa (1.82m). The highest collar diameter was found in A. chinensis (5.93cm) followed by A. catechu (4.97cm), T. arjuna (4.27cm), B. ceiba (4.23cm) and T. catappa (3.12cm) at the age of two years. In the Bamansunder site, the highest survival was recorded for T. arjuna (88%) followed by B. ceiba (78%), T. catappa (74%), T. belerica (68%) and A. chinensis (60%). The highest height was recorded for B. ceiba (0.99m) followed by A. catechu (0.94m) T. arjuna (0.93m) and A. chinensis (0.92m). Considering the survival, height and diameter growth, T. arjuna, A. chinensis, B. ceiba, T. catappa and A. catechu were found promising and may be suitable for planting in the raised lands of the eastern coastal belt of Bangladesh. Islam, S. A., Miah, M. A. Q., Alam, M. M. & Rasul, M. G. (2016). Initial growth performance of ten woody medicinal tree species in eastern coastal belt of Bangladesh. Journal of Bioscience and Agriculture Research, 11(01), 930-935. Islam, S. A., Miah, M. A. Q., Alam, M. M. & Rasul, M. G. “Initial growth performance of ten woody medicinal tree species in eastern coastal belt of Bangladesh”. Journal of Bioscience and Agriculture Research, 11.01(2016), 930-935. Islam, S. A., Miah, M. A. Q., Alam, M. M. & Rasul, M. G. “Initial growth performance of ten woody medicinal tree species in eastern coastal belt of Bangladesh”. Journal of Bioscience and Agriculture Research, 11. no. 01(2016), 930-935. Abstract: The experiment was conducted to find out the effect of different sources of nutrient and hormones on the growth and yield of tomato. The study consisted of Factor A: different nutrient sources viz. N0: Control; N1: Cowdung (60 tha-1); N2­: Vermicompost (7 tha-1) and N3: Recommended dose (10 ton Cowdung + 550 kg Urea + 450 kg TSP + 250 kg MPha-1) and Factor B: different hormones viz. H0: Control; H1: NAA (30 ppm) and H2: GA3 (30 ppm). The minimum days (32d) required from transplanting to 1st flowering from N3H2 and the maximum (39d) was needed from N0H0. The treatment N3H2 performed better than other treatments and produced maximum (59.11) number of fruits per plant, maximum (95.82 g) weight of individual fruit and maximum (83.87 ton) yield per hectare. Treatment combination, N3H2, enhanced fruit production by about three times over control (20 fruits plant-1) and individual fruit weight by 1.6 times compared to control (59 g plant-1) resulting maximum fruit yield (83.87t ha-1) which is 2.4 times higher than that of control, N0H0. It appears that the recommended fertilizer dose along with GA3 application may be recommended for tomato production. Rahman, M. M., Haque, M. E., Parveen, K., Tipu, M. M. H. & Islam, M. S. (2016). Effect of different sources of nutrient and hormones on growth and yield of tomato. Journal of Bioscience and Agriculture Research, 11(01), 936-941. Rahman, M. M., Haque, M. E., Parveen, K., Tipu, M. M. H. & Islam, M. S. “Effect of different sources of nutrient and hormones on growth and yield of tomato”. Journal of Bioscience and Agriculture Research, 11.01(2016): 936-941. Rahman, M. M., Haque, M. E., Parveen, K., Tipu, M. M. H. & Islam, M. S. “Effect of different sources of nutrient and hormones on growth and yield of tomato”. 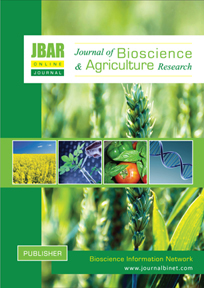 Journal of Bioscience and Agriculture Research, 11 no.01(2016): 936-941. Authors: Alam, M. S. and Islam, M. F.
Abstract: The experiment was carried out in Acidic Northern and Eastern hills Soil (AEZ 29) at Regional Agricultural Research Station (RARS), Akbarpur, Moulvibazar during Kharif 1 of 2012 to observe the effect of zinc (Zn) and boron (B) on the seed yield and yield contributing characters of mungbean. There were four levels of zinc (0, 1.0, 2.0, and 4.0 kg/ha) and boron (0, 0.75, 1.5, and 3.0 kg/ha) along with a blanket dose of N24 P20 K30 S15 kg/ha. Experiment was laid out in RCBD with three replications. Incase of zinc application, highest seed yield (1.418 ton/ha) was obtained from 1.0 kg Zn/ha which was statistically similar (1.358 t/ha) with dose 1.0 kg Zn/haand but significantly higher (1.034 t/ha) than the control. Again for boron application,the highest seed yield (1.550 t/ha) was found from the treatment 1.50 kg B/ha which was statistically identical with 3.0 kg B/haand the lowest (0.927 t/ha) for control. The combined application of zinc and boron showed significant effect on mungbean yield than the single application of zinc and boron. Results showed that the combination of Zn1.0B1.5 produced significantly higher yield (1.677ton/ha) than the control (Zn0B0) combination (0.64 ton/ha). Combined application of zinc and boron were observed superior to their single application. Therefore, the combination of 1.0 kg zinc per hectare and 1.5 kg boron per hectaremight be considered as suitable dose for mungbean cultivation in acidic soil of Sylhet region of Bangladesh. Alam, M. S. and Islam, M. F. (2016). Effect of zinc and boron on seed yield and yield contributing traits of mungbean in acidic soil. Journal of Bioscience and Agriculture Research, 11(02), 941-946. Alam, M. S. and Islam, M. F. “Effect of zinc and boron on seed yield and yield contributing traits of mungbean in acidic soil”. Journal of Bioscience and Agriculture Research, 11.02(2016), 941-946. Alam, M. S. and Islam, M. F. “Effect of zinc and boron on seed yield and yield contributing traits of mungbean in acidic soil”. Journal of Bioscience and Agriculture Research, 11. no. 02(2016), 941-946. Authors: Alam, M. P., Bhuiyan, M. S. A. & Bhuiyan, A. K. F. H.
Abstract: The study was conducted in four districts of Bangladesh to investigate the morphology, morphometry and reproductive characteristics of indigenous horses. Morphology, morphometry and reproductive traits were individually measured on male and female horses of different age groups. Chestnut (42%) was the predominant coat color. Effects of age group were significant (p<0.05) in stallion only on head length and buttock height whereas significantly higher body weight (p<0.01), body length (p<0.01), chest girth (p<0.05), wither height (p<0.01), back height (p<0.01), croup height (p<0.05), croup depth (p<0.05) and scapula length (p<0.05) in different age groups of mares were observed. Age at first heat, age at first conception, age at first foaling, foaling interval and gestation period of mares were respectively 1.95±0.07, 2.15±0.06, 3.15±0.06, 1.16±0.01 years and 11.44±0.09 months.These data would provide basic information required for designing any program aiming at conservation and sustainable use of indigenous horses of the country. Alam, M. P., Bhuiyan, M. S. A. & Bhuiyan, A. K. F. H. (2016). Morphology, morphometry and reproductive characteristics of indigenous horses in Bangladesh. Journal of Bioscience and Agriculture Research, 11(02), 947-954. Alam, M. P., Bhuiyan, M. S. A. & Bhuiyan, A. K. F. H. “Morphology, morphometry and reproductive characteristics of indigenous horses in Bangladesh”. Journal of Bioscience and Agriculture Research, 11.02(2016), 947-954. Alam, M. P., Bhuiyan, M. S. A. & Bhuiyan, A. K. F. H. “Morphology, morphometry and reproductive characteristics of indigenous horses in Bangladesh”. Journal of Bioscience and Agriculture Research, 11. no. 02(2016), 947-954. Authors: Rahman, F., Alam, M. P., Hoque, M. A. & Bhuiyan, A. K. F. H.
Abstract: The present study was conducted to reveal the G×E interaction in growth and milk yield traits of indigenous Red Chittagong cattle reared in two production environments. Traits included: birth weight (BW), weaning weight (WW), average daily gain (ADG), daily milk yield (DMY), lactation length (LL) and lactation yield (LY). Data accumulated on a total of 161 animals during 2005 to 2012 in growth traits and 76 animals during 2005 to 2008 in milk yield traits. The heritability of BW, WW and ADG were 0.47±0.04, 0.49±0.17, 0.49±0.16 respectively and the heritability of DMY, LL, LY were 0.47± 0.07, 0.47±0.06 and 0.47±0.08, respectively. The effect of genotype x environment interaction was non-significant (p>0.05) on BW, WW and ADG whereas its effect was highly significant (p<0.001)on DMY, LL and LY. Correlations (genetic) between the breeding values of BW, WW and ADG in two production environment were 0.19, 0.13 and 0.11, respectively and correlations (genetic) between breeding values of DMY, LL and LY were 0.07, 0.18 and -0.01, respectively. The said genetic correlation values represented the degree of genotype by environment interaction arising on the RCC in the said two production environments.Traits with positive genetic correlation values indicate their acceptability (no difference) where as traits with negative correlation values indicate that RCC parents should be selected and used separately in two production environments. Rahman, F., Alam, M. P., Hoque, M. A. & Bhuiyan, A. K. F. H. (2016). Genotype x environment interaction in growth and milk yield traits of indigenous Red Chittagong cattle. Journal of Bioscience and Agriculture Research, 11(02), 955-962. Rahman, F., Alam, M. P., Hoque, M. A. & Bhuiyan, A. K. F. H. “Genotype x environment interaction in growth and milk yield traits of indigenous Red Chittagong cattle”. Journal of Bioscience and Agriculture Research, 11.02(2016), 955-962. Rahman, F., Alam, M. P., Hoque, M. A. & Bhuiyan, A. K. F. H. “Genotype x environment interaction in growth and milk yield traits of indigenous Red Chittagong cattle”. Journal of Bioscience and Agriculture Research, 11. no. 02(2016), 955-962. Abstract: An experiment was conducted at the Bangladesh Jute Research Institute (BJRI), Regional Station, Rangpur, Bangladesh during July to December, 2014 and 2015 to study the effect of drying period of harvested plant and method of threshing on yield and quality of kenaf seed. The trial used three drying period of harvested plant (viz., threshing without drying of harvested plant, threshing after 7 days drying of harvested plant, threshing after 14 days drying of harvested plant) and two method of threshing (viz., Traditional method of threshing, mechanical method of threshing) in a Randomized Complete Block Design (RCBD) with four replications. The highest kenaf seed yield was obtained at 7days drying period and from mechanical method (788.03kgha-1) with minimum requirement of time. Seed quality was found better at no drying of harvested plants in both the threshing methods. Mollah, A. F., Khan, M. A., Tareq, M. Z., Hoque, A. B. M. Z. and Debnath, M. R. (2016).Effect of drying period of harvested plant and method of threshing on yield and quality of kenaf seed. Journal of Bioscience and Agriculture Research, 11(02), 947-952. Mollah, A. F., Khan, M. A., Tareq, M. Z., Hoque, A. B. M. Z. and Debnath, M. R. “Effect of drying period of harvested plant and method of threshing on yield and quality of kenaf seed”. Journal of Bioscience and Agriculture Research, 11.02(2016): 963-967. Mollah, A. F., Khan, M. A., Tareq, M. Z., Hoque, A. B. M. Z. and Debnath, M. R. “Effect of drying period of harvested plant and method of threshing on yield and quality of kenaf seed”. Journal of Bioscience and Agriculture Research, 11 no.02(2016): 963-967.